TERRI B. from Sanatoga! Congratulations! Terri has received 2 free tickets to opening night of RAGTIME, The Musical at the Tri-County Performing Arts Center on High Street. RAGTIME will run from June 3-20. Thank you to Tri-PAC and Village Productions for donating the tickets! 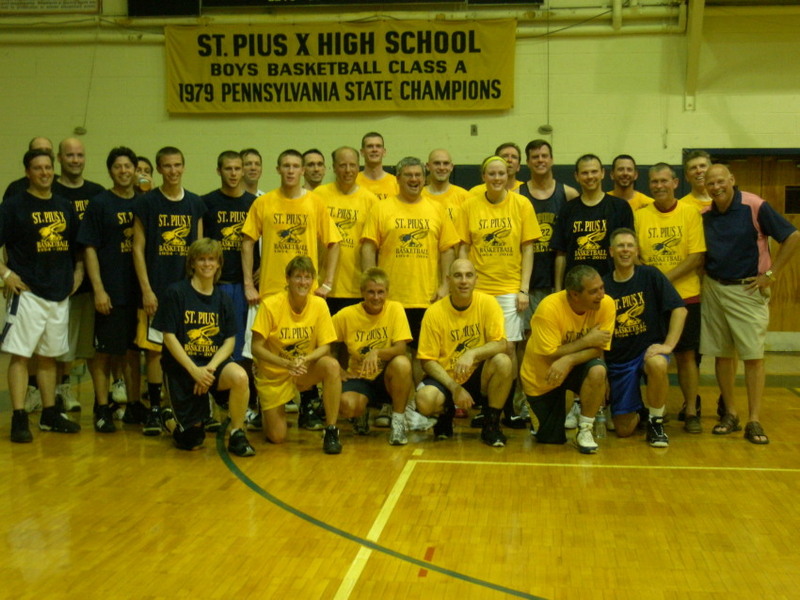 The hot, humid air in Father Doyne Hall tried to smother the 45-50 former players who showed up for the last game ever, but it didn’t stop old-timers and youngsters alike from running up and down the court for about three hours last Friday night. Those guys from this year’s graduating class of 2010 sure can shoot the 3! There was also an impressive showing from the – ahem – older grads, some of whom are still playing regularly. Former coaches on hand included Joe Donahue, Pete Sovia, Michele Repko Dunleavy, and Randy Reber, who will take over the helm for Phoenixville’s boys’ program next season. Thanks for the memories, St. Pius X! While we’re on the topic of basketball, I’ve changed the photo in the sidebar to my beloved neighborhood hoop at Franklin Elementary School in the North End. I’ve stopped by to visit this hoop several times over the years, which looks to be the exact same iron pole, backboard and rim where I spent so many hours playing, practicing and shedding tears of frustration while growing up. I won’t go on here about the kind of love a person could feel for a simple thing like that, for that place. The blacktop is crumbling now, which makes me just plain sad, but also reminds me of why I’ve been coming back to Pottstown these days. There are a lot of complicated, interconnected and entrenched reasons why a playground blacktop would be crumbling. I’m just trying to do my part to move things in the direction of smoothing that out for the kids coming along now who deserve to have their ball come predictably back up to their fingertips when they make their next move. Game on! 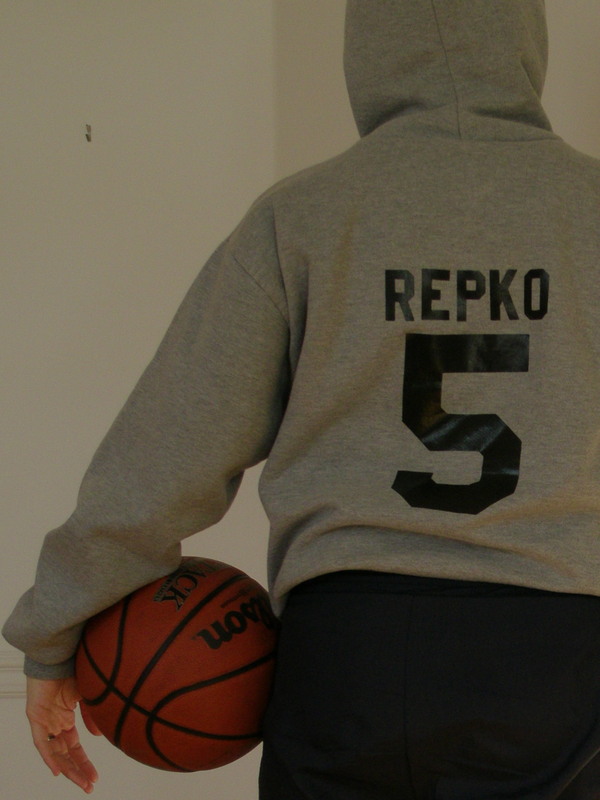 Tonight I’ll be at Father Doyne Hall at St. Pius X for one last run up and down the hardwood. While I’m proud of a lot of things accomplished during my Pius years, being part of two Ches-Mont championship teams in 1978 and 1979 ranks right up there, mostly because a lot of people thought we couldn’t do it, but also because I now think of it as a defining period for me, personally and politically, although I would not have described it that way then. In the course of doing research for a memoir I’m writing about growing up, I’ve spent some time at the microform reader at the Pottstown Public Library, reading old articles from The Mercury. As so often happens, while I was looking for one particular article, I got distracted by another. Back in those days, a sportswriter by the name of Ken Murray* had a column in The Mercury called “Ken’s Corner.” On June 21, 1974 it was titled, “Is There Room For a New League?” and it was all about St. Pius X looking to get into a new league now that the Suburban Athletic Conference had disbanded. Murray wrote, “What league could the small Catholic school join without stepping in over its head?” He goes on to speculate about a league of smaller schools, perhaps including Pottsgrove, Upper Perk, Methacton and Landsdale Catholic. I’m pretty sure I read that piece back then, even though I would have been just eleven years old. I was a sports junkie. I followed major league baseball, basketball and football. And that was the year that I – and a handful of other girls – barged our way into Little League baseball in Pottstown. Back then, competition – any competition – felt like a matter of life and death to me. (I’m not always proud of that, but that’s for another time.) As a tomboy, I’d had a chip on my shoulder for as long as I could remember. Anything a boy could do, I wanted to do better. And then sports opportunities for girls were federally mandated through the passage of Title IX in 1972, and I felt personally vindicated. In middle school at St. Al’s I dreamed of playing basketball for Pius (the Suburban Catholic League champs in 1974), and it’s not inconceivable that I carried a kind of “I’ll show you, Ken Murray and all you other doubters” attitude around for years until I got the chance. Pius entered the Ches-Mont my junior year. The league had some big schools – Coatesville, Downington, West Chester Henderson, West Chester East, Pottstown. Murray was absolutely right. Pius was a small school. It was the only Catholic school. And we were all white. Racial tensions from the 70s still ran high; I remember police escorting us off the bus at some schools. Playoff games and title games were fraught with emotion and a kind of danger. And we won. Yes, we had some amazing talent (shout-out to my classmate and teammate, Carol Glutz, the school’s all-time leading scorer.) But under Coaches Bernadette and Bill Travers, we also worked our butts off. Every day. All of this opened my eyes to a larger world: laws got passed in Washington that affected me personally. Gender equity, race relations, and social unrest weren’t far-away concepts that just appeared in headlines. They played themselves out in our own towns and on basketball courts. I think I was also tuned in because I was in the midst of getting a Catholic education, steeped in the values of social justice. While I have not been a practicing Catholic for quite some time, that blood still runs through me. There’s no shaking that, nor do I want to. So, when I step on the court at Pius tonight and pose for photos with our championship banner with my sister, Michele Dunleavy (varsity girls’ coach at Phoenixville), and my old teammates and friends, all this – and a whole lot more – will be running through my heart and head. And through my veins. St. Pius X will always be more than a building. Its spirit will continue to move through all those who walked its halls and played on its courts and fields – sometimes as though their lives depended on it. The monthly meeting and speaker series organized by Citizens for Pottstown’s Revitalization will take place this Friday, May 21, from 7-8 pm at the PAL building at 146 King St., Pottstown, PA. The featured speaker is Tom Carroll, president of Preservation Pottstown, tireless community volunteer and all-around positive guy. The theme of Tom’s talk will be “Building Community Vitality.” He’ll be telling a story that made a difference in his life and how he views communication with others. He’ll also touch on “What is a non-profit corporation?”, Preservation Pottstown’s history and where they are today. If you want to learn more or volunteer, call 215-316-6383. If you’ve been thinking about getting involved in any aspect of Pottstown’s revitalization, or if you would like ideas and support for organizing a neighborhood watch or even a block party, come to a CPR meeting. They’re a group of friendly, engaged residents trying to make all of Pottstown’s neighborhoods the best they can be. CPR is online at http://www.vivapottstown.com. The three candidates for Superintendent of the Pottstown School District will appear in a public forum tonight at 7 pm at Invictus Mininistries, 79 N. Hanover St. (at the corner of Beech.) They will all respond to the same questions, which can be found in this Mercury article. You can even post your own questions there, and the Mercury will pass them on. Whether or not you agree with how this forum came to be scheduled, the bottom line is that it’s a chance for all residents to see the candidates speak and interact with the public, knowing they are one step from leading the district. The candidates are Edgewood Elementary Principal Angela Tuck, Director of Education Jeff Sparagana, and Assistant Superintendent Reed Lindley. Each one has a wealth of experience in the district and a broad array of loyal supporters. The community is fortunate to have three candidates qualified to step up to lead. This Thursday evening, May 20th, Village Productions/Tri-County Performing Arts Center will be leading a Community Outreach Program to provide education and encourage discussion about the social and historical themes in the musical production, RAGTIME. It will take place from 7-8 pm at Christ Episcopal Church at 316 E. High Street, Pottstown. The discussion will be led by the Director of RAGTIME, Neal Newman, and the Music Director, Deborah Stimson-Snow (who is also the Artistic Director for the Tri-PAC). RAGTIME is based on the award-winning E.L. Doctorow novel of the same name, and is being performed at the Tri-PAC on Thursdays through Sundays, June 3rd through 20th. The public is also welcome to access a complimentary STUDY GUIDE about the work, which can be used by individuals or groups before or after the program to provide information about the plot and social and historical issues in RAGTIME, which revolve around immigration, culture clashes, and the hopes and dreams of the featured characters. The STUDY GUIDE can be downloaded directly from the Tri-PAC website here.